The Chinese language has a vast gamut of auxiliary modals and it isn’t at all rare to find characters that can be translated in the same way but possess shades of meaning and context and slightly different ways of use. To fully master the Chinese language it is good to examine it in detail, even if at times, when speaking about a language, it’s best not to think about things too much and let the words flow freely from our mouth. Auxiliary modals, placed to the left of the verb, modify the meaning. Auxiliary modals are characters that express: to be able to, to want, to have intentions to, to have to, to need. It expresses the possibility that something will take place; it also expresses a capacity or acquired ability (something that you know how to do or learned to do). To conclude, it can serve as an indicator of the future. Tomorrow it could rain / tomorrow it will rain. Tomorrow I could be busy / tomorrow I will be busy. He knows how to speak Chinese. Quan Shiran knows how to teach. Nǐ huì shuō fǎyǔ ma? Bù, wǒ bù huì shuō. Do you speak French? No, I don’t speak it. 会 (huì) can be preceded by 很 (hěn) “many”, 真 (zhēn) “truly”, 最(zuì) “the most”, to express an ability or innate talent. Wǒ māma hěn huì zuòfàn. My mother knows how to cook very well. Quán Lǎoshī zuì huì jiāo zhōngwén. Professor Quan is the best Chinese teacher. Wǒ zhēn bù huì hējiǔ. I really don’t manage to drink. It expresses the physical ability to do something; indicates the possession of permission to do something; also expresses the impossibility of doing something. Wǒ de sǎngzi téng, bù néng shuōhuà. My throat hurts, I can’t speak. Xiànzài zài xiūlù, tā bù néng guò. Now they’re fixing the road, he can’t pass. Zhèlǐ néng xīyān ma? Bù néng. It expresses a physical ability or one based on knowledge; also expresses the permission to do something or the possibility/capability to do something. Tā yǐjing bāshí suì le, bù kěyǐ qí zìxíngchē le. By now he’s eighty years old, he can’t ride a bike. Māma shuō wǒ kěyǐ gēn péngyou qù kàn diànyǐng. Mamma said that I could see the movie with friends. Quán Shīrán kěyǐ jiāo nǐ zhōngwén. Quan Shiran can teach you Chinese. Wǒ kěyǐ qù cèsuǒ ma? Wǒ kěyǐ wèn nǐ wèntí ma? Quite often it is considered as an adverb. 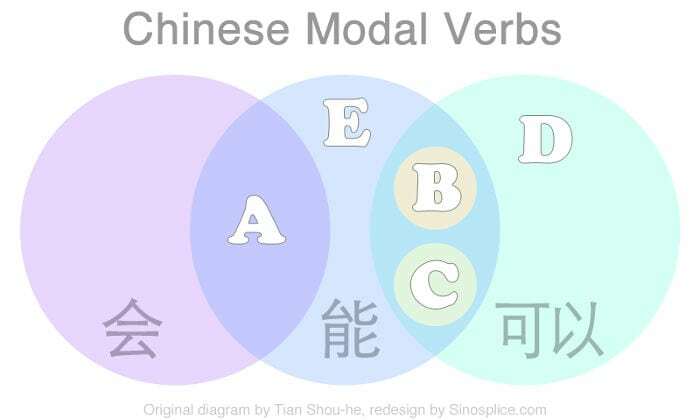 Seen from this perspective, 可能 can be put in front of an auxiliary modal. Míngtiān bù huì xiàyǔ, dànshì kěnéng huì hěn lěng. Tomorrow it won’t rain, but perhaps it could be cold. Tā kěnéng bù huì lái. It expresses a need; also expresses an inevitable condition. Wǒ māma yào qù chāoshì mǎi dōngxi. My mom has to go to the supermarket to buy some things. Zuòrén yào chéngshí, zuòshì yào fùzé, xuéxí yào rènzhēn. When you deal with other people, you have to be honest; when you handle assignments you have to be responsible; when you study, you have to be diligent. Guò mǎlù de shí hou, yào jìde xiān kàn liǎng biān yǒu chē. When you cross the street, you must first remember to look both ways for cars. They express a necessity or indicate a conjecture. Wǒ péngyou yá téng, tā bù yīnggāi chī táng. My friend has a toothache, he shouldn’t eat sweets. Zhè běn shū yīnggāi shì wǒ lǎoshī de. This book should be my professor. Wǒ děi xiūxi yī huì. I have to rest for a bit. Jīntiān wǒ děi zhǔnbèi kǎoshì. Today I have to prepare for a test. It expresses the need to, also expresses a personal need. Nǐ xūyào chī yào ma? Do you have to take medicine? It expresses a need at any cost and the objective necessity to be. Nǐ bìxū qù zhǎo xiàozhǎng. You absolutely must go to the Principal. It expresses an intention; it is also used as an indicator of the future. Wǒ yào xué dǎlánqiú, tā yào xué tīzúqiú, tā yào xué páiqiú. I want to learn how to play basketball, he wants to learn how to play soccer, she wants to learn to play volleyball. Tā míngtiān yào qù shūdiàn. Tomorrow I’ll go to the library. Míngnián èr yuè wǒ yào qù Chóngqìng. Next February I’ll go to Chongqing. The professor wants us to study. It expresses a desire, or having an intention to. Wǒ xiǎng qù Zhōngguó fàndiàn chī zhōngguó cài. I intend to go to the Chinese restaurant and eat Chinese food. Wǒ yě xiǎng qù Zhōngguó xuéxí. I also want to go to China to study. Wǒ xiǎng zài péngyou nàli kàn Rìběn mànhuà. I want to read Japanese manga at my friends house. It expresses a desire, or having a desire to. Xiǎo háizi bù yuànyi guānshang diànshì. The kids don’t want to shut off the television. Tā yuànyi gēn wǒ hézuò. He wants to collaborate with me.